Lulu's On The Move is a Las Vegas food truck, essentially a breakfast and bakery spot on wheels. For a mobile kitchen, this crew is remarkably flexible, having turned out everything from pizza to sausage, not to mention more sweet treats than you can imagine. And this creation combines the savory and sweet to create what we believe is the first dessert sandwich you can eat like a meal. 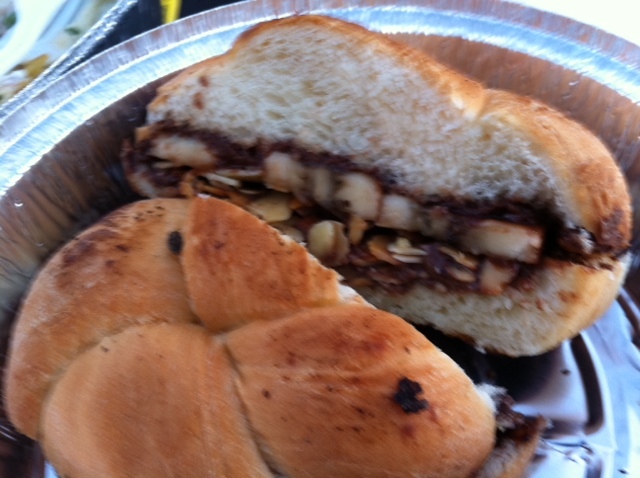 Packed into a slightly sweet, light and fluffy brioche roll is a generous slathering of nutella, sliced bananas and toasted almonds. This combo creates some mouth-pleasing moosh and some crispy bites, and a whole lot of hazelnutty, faux-choco-goodness. It's so rich, we couldn't finish it. But we wanted to.